Imperial Guard are the latest army to get a new Codex. So Marc took the new Imperial Guard Codex for a test run against my Tau army. As an Imperial Guard noobie, Marc needed some help in building a list, which James and I were happy to help him with. Meanwhile I took my usual Tau army to see how they would fair. Now, I haven't read the new Imperial Guard Codex myself, so no doubt we've missed one or two restrictions, like Vehicle Squadrons not being allowed to receive Special Orders, or so I'm told. I need to check this. Either way, what I imagined would be a walk in the park against the Imperial Guard turned into a bloody massacre! Command Squad with master of artillery and lascannon team. All have camo cloaks. Marc won the roll, choosing the table quarter with a large building while forcing me to accept the corner with a tiny building. Fine by me, because my army needs space to manouvere. He then proceeded to set up his infantry platoons inside the building while the command squad and command groups set up behind the building. The 10 man infantry squads combined, using one of the new Imperial Guard rules, into 20-man squads. He also announced that all his Imperial Guard tanks would remain in reserve. I looked at this firebase of 7 lascannons and thought better of deploying within 48", especially if he would be taking the first turn. I place my Tau Broadsides and Hammerhead in the far opposite corner, some 60" away so I could shoot him from a safe distance and avoid all those AP2 weapons. I rolled to seize the initiative, failed and the game got underway. Marc's master of artillery calls in a barrage, which scatters wildly off the board. I fired my railguns. I think I only killed 1 guardsman because of cover saves. Marc rolls for reserves. Nothing comes on. Fires another artillery barrage and misses. I roll for my reserves, getting 1 Devilfish, the Skyray, Tau Battlesuit flamer/missile team and my Tau Battlesuit command team armed with plasma rifle and missile pod. It's important to remember that at this point I was wondering how to get kill points and how to stop all of Marc's tanks from rolling on in turn 3 and probably wiping out my Broadsides and Hammerhead. I also wanted to kill his Imperial Guard command squad, because sooner or later that artillery strike was going to hit something important. I deployed the skyray on the far right, opposite his firebase in the building, with a clear line of sight to his command teams. On the other side of the ruin on the right, I deployed the Tau Devilfish with the Tau flamer Battlesuit team behind it while the Tau Battlesuit command team were behind the Skyray. The Skyray targeted the two nearest command teams with its markerlights, scoring a hit on both, before opening fire on the nearest with its burst cannons, using the markerlight to hit on 2+. The squad were wiped out while the Tau Battlesuit command team used the other markerlight to boost their ballistic skill, but they only managed to kill 2 of the 5 models due to them passing most of their cover saves. The Devilfish was out of range of that command team, so combined its fire with the Tau Battlesuits at the Imperial Guard squad in the building, but only killed 1 or 2 models between them. I would have fired the Tau Battlesuit missile pods at the reduced command team, but I didn't have line of sight. However, the plan is to move them forward in the following turns and get their twin linked flamers into range to flush out the Imperial Guard platoons. Meanwhile the Broadsides and Hammerhead fired their railguns at the same Imperial Guard squad, because they couldn't see anything else through the buildings. I think they killed 1 more Imperial guardsman. Marc's Leman Russ squadron and fast attack tank squadron rolled onto the board. The Leman Russ' took up position opposite the Skyray. The fast attack tanks occupied the other side of the firebase building, but had nothing for their heavy bolters to fire at. 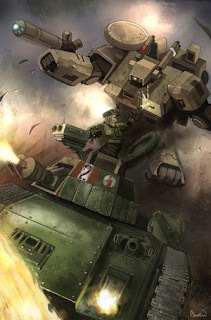 The Imperial Guard commander 'Ordered' the Leman Russ squadron to Bring It Down against the Tau Skyray, allowing the whole unit to reroll to hit. The mass of shots was mostly ineffective, but for the Vanquisher cannon on manned by the Tank Ace special character which is a Strength 9, 2D6 armour penetration shot with +1 to the armour penetration roll. Straight through the 13 front armour. I rolled for my disruption pod save...and fail. A 6 is rolled and BOOM! the Tau Skyray is gone. One of the Tau Battlesuit bodyguards takes a wound in the explosion. The Tau firewarriors inside disembark out the side and fail their pinning test. Lastly, the artillery strike misses again. 2 moe Tau Devilfish arrive and line up alongside the destroyed Devilfish in an attempt to safely extract the Tau Battlesuit flamer/missile team. They fire their smart missiles at the Imperial Guard squad in the building, but only kill 2 guardsmen. Seeking cover, the Tau Battlesuit command team move (like infantry) into the nearby ruin while firing at the last 3 members of the Imperial Guard command team, wiping them out. The Tau Broadsides and Hammerhead target the side armour of the Imperial Guard fast attack tanks, penetrating the side armour, destroying the Banewolf in a mighty explosion, which kills a single Imperial guardsman. The Tau Battlesuit team with flamers and missiles are now stranded and can't advance safely towards the Imperial Guardsmen in the building and instead fire their missiles at the Devildog, stunning it so it may not shoot next turn before jumping behind the newly arrived Devilfish. 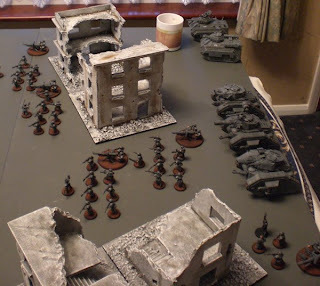 The Leman Russ squadron rumbles forward and receives 'Special Orders' from the Imperial Guard commander to Fire On My Target against the Tau Battlesuit Command Team in the ruins (this forces you to reroll any successful cover saves). The tanks hit with practically everything, killing the Tau Commander and his 2 shield drones while the 2 Tau Battlesuit bodyguards remain alive. Both 20 man squads of the Imperial Guard platoons are Ordered to Bring It Down against the nearby Tau Devilfish, scoring 4 hits, 2 of which penetrate while only 1 of the shots is saved by the disruption pod. Fortunately the the tank is only stunned and may not shoot next turn. The Tau Broadsides and Hammerhead destroy the Devildog in a massive explosion which kills 2 Imperial Guardsmen from inside the building. The Tau Battlesuit Command Team jump out of the ruins to hide out of sight. But one of them fails his dangerous terrain test (he's already taken 1 wound from earlier) and dies! The Tau skimmers begin falling back from the Imperial Guard firebase, towards the Hammerhead and Broadsides. The Tau Battlesuits with flamer/missile pod jump behind one of the Devilfish. 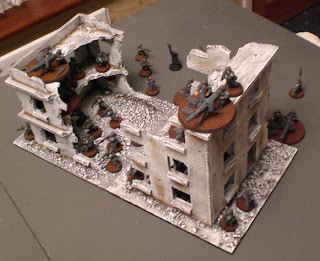 They all fire at the Imperial Guard in the building, but seem to do little or no damage because of the cover. The Tau Broadsides and Hammerhead target the side armour of the Leman Russ squadron from across the board, destroying the Leman Russ Demolisher while stunning the others, but as Vehicle Squadrons can always move and shoot regardless, it has no effect. The Imperial Guard don't seem to do so much this turn, but Brint It Down orders allow the Imperial Guard platoons to destroy the Tau Devilfish which the Tau Battlesuits are hiding behind. The Tau Firewarriors disembark and are pinned. The remaining Tau Devilfish falls back towards the Tau Broadsides and is now safely out of weapons range. The Battlesuits fire at the Imperial Guard squad in the building, inflicting another casualty, then jump back behind the wrecked tank. The surviving Tau Battlesuit Bodyguard hides behind the wall of the ruin, but takes a quick shot at the Imperial Guard squad in the building, killing another. 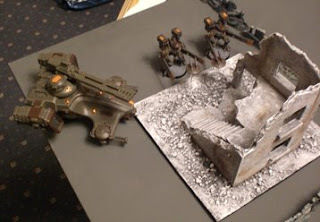 The Tau Broadside and Hammerhead fire at the Imperial Guard tank squadron, blowing the battlecannon off the Leman Russ. Marc's guns are now mostly out of range or having nothing to fire at. The Leman Russ squadron fires at the Hammerhead, but misses. Then the artillery strike from the Imperial Guard command squad scatters 3" on to the centre of the Tau Battlesuit team with flamers/missiles. The squad are out in the open. The Strength 9, AP3 large blast wounds every model in the squad, killing them all outright with no save. The Tau Broadsides and Hammerhead target the Imperial Guard tank squadron, destroying the Leman Russ, leaving just the Vanquisher remaining. Victory to the Imperial Guard! First, I'd like to say owch. Second, I'd like to have passed some disruption pod saves. I'll confess to not having a great interest in the new Imperial Guard army after looking at the points cost and thinking "actually, that's quite balanced, I'm cool with that." But what I didn't know about, prior to this game is the Orders which can be issued. Bring It Down (and a variant, which I can't remember, for shooting at troops) allows a unit to reroll to hit. Fire On My Target forces an enemy unit to reroll their cover saves. Tau Markerlight can -1 from an enemy's cover save. Now I'm not normally one to gripe, but it seems like the Imperial Guard basically get 'super Tau markerlights' for FREE. Obviously, this is very frustrating when Tau players have to pay between 12 and 30 points in various shapes and forms for each markerlight. It's even more frustrating when the Command Squad (usually hidden away) has camo cloaks for a boost to their cover save. But new Imperial Guard Codex aside, let's talk tactics, because that's what Tau are all about. My start was good, deploying the Broadsides and Hammerhead out of range. My 2nd turn could have been better. Had I passed that 1 disruption pod save, the Imperial Guard Command Squad would have been killed by the Skyray while the Tau Battlesuit command team would have mopped up the last of the Imperial Guard command teams for the platoons. I felt that I had to bait him somehow into deploying his tanks away from my railguns. But now that I think about it, perhaps a firefight between the tanks, Hammerhead and Broadside would have been okay? I can imagine the Hammerhead needing to pass a disruption pod save, just like the Skyray (and failing), but perhaps the Broadsides could have fought them all off? Unlikely considering the number of lascannons. In the start of the game I saw his firebase of 40 men as an immovable object, but somehow thought I could get a unit of flamer Battlesuits in their behind a Devilfish when that Devilfish wasn't very likely to survive past its first turn on the board. Perhaps I should have kept everything with the Hammerhead and Broadsides then fought any reserves out of my quarter? But the artillery strike which came down every turn scared me into spreading out my forces. While I could put my failure in this game down to 1 disruption pod save, my tactics were less than perfect, especially when I tried my usual trick of lining up my Devilfish to leap frog a Tau Battlesuit team behind in an attempt to get them out of trouble. The error in this method was that the massed smart missiles from the Devilfish couldn't hurt the Imperial Guard in the building and were in range for all those rerolling lascannons. However, despite all my screw ups, the 'better than a markerlight' Orders the Imperial Guard get for free and Marc placing Orders on tank squadrons, which apparently can't take orders (need to check this! ), the game would have been a draw had the artillery strike not very luckily landed on the Tau Battlesuit team in the final turn. Marc is still fine tuning his Imperial Guard army and may take an officer of the fleey instead of an officer of artillery next time. Meanwhile I'm going to continue with the army list I played and fine tune my tactics. Stay tuned for Imperial Guard Game 2...when I finish writing it in a few hours. Nice game mate! I can see myself having a whole lot of trouble against lists like this. after readying the report I was wondering did he place more then 1 unit in that big building because If i rember correctly this sin't allowed anymore (need to check book for this but don't have it on me). The fact that eh could castle up was a big problem for you because it ment you had to get close to kill them with flamers and such which was dangerous considering the orders. But I'll guess we will ahve to see when I read your 2de game how it turned out for you. Anyways thanks for the great report and cool pictures. Good report. Another thing to check up on might be that I'm pretty sure IG vehicles/tanks can't receive orders, I think its just their infantry, once again: not sure, but worth looking into. Aye, vehicles cannot receive orders; only Infantry. On top of that, the command squad issuing that order must be within 12" or 6", depending if its company or platoon command, and it must have LOS to target for the shooty orders. Also, because the tanks moved onto the board on turn three, Pask's +1 to the roll does not take effect. 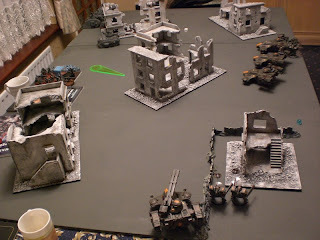 Just this week one of our buddies tried out his 'new' Guard against a Tau/Ork force, the only thing that I remember the most were those dang orders he kept using, to devastating effect. Nice battle report (as usual)! Also, vehicle squadron rules cause "Stunned" results to become "Shaken" and "Immobilized" results to become "Destroyed", so the stunned tanks in the squadron would have been able to move still, but not shoot. Other than that, it seems that Mr. Cook played things to the letter. Tip: Have the command squad order ITSELF to "Bring it Down" against a vehicle or MCreature. This allows the Master of Ordnance to re-roll the scatter for his incredibly in-accurate Artillery Barrage! So yeah orders are only for infantry. Great report, but here is a cheesy way of playing the master of ordance. Buy a mortar into the squad (thats 5 points) and read the rules for multiple barrages (that loop hole is crazy). Better luck next time those disruption pod rolls were very bad luck. BTW why did Marc reserve the tanks? Did he fear railguns? You're right, the tanks cannot receive orders. Nice report though - looking forward to the next one. I have a feeling that the rules for firing with the Master of Ordnance override the possibility for using the multiple barrages rule in the BRB, but that's just me. I'll need to take a closer look at both when I have the time. Very nice reports, and it definitely gives me a lot more to think about over the next few months. Great battle report. Even with the orders mix up Tau are still able to hold their own. The markerlight comparison is dead on. The one thing I am not liking about the new guard is they can now play a kill point denial battle by combining squads. It is almost begging you to not place objectives in buildings.